If you are looking for a career in IT, usually people start in this role as an IT Administrator. To do this role, you will need to have a keen interest in computers and IT and enjoy trying to do new things or fix computers etc. You must also be organised and efficient and able to communicate with a variety of different people and explain technical problems in a non technical way for the less technically minded. If you have seen a role in which you would like to apply for, please see the below letter which you can use as a guide. I have recently seen your advertisement for an IT Administrator in (where) on (when) and I would like to apply for this role. Please find enclosed my CV which details my experiences. I have always had an interest in computers and have always wanted to pursue a career in IT from a very early age. I have always been requested to fix things and upload new programs for friends and family as they see how I enjoy working in this area. I am now seeking to continue my passion as a career and am keen to do some formal qualifications as necessary to improve my skills for myself and the company I have my career with. I am able to build a computer from scratch and I have knowledge of how to set up computers and many programs and programs that I am unfamiliar with, I will learn very fast in my own time as necessary. I am a team player as well as being able to work on my own initiative and I feel that I can communicate effectively with others. I see from your advert that I will be required to provide support to staff and I feel that I can do this and explain IT in non technical terms in order to help them understand. I am now looking for a company to give me a chance to start my career and keep my IT skills up to date and to keep ahead of the IT industry to be useful to my employer. I have enclosed a copy of my CV and should you be interested in my skills I look forward to hearing from you. I should like to apply for the position of IT Administrator, as advertised recently. As part of my current duties in a similar role, I am responsible for ensuring that all PCs in use in the organisation are compliant, that the systems software and applications are upgraded and that the virus, spam and firewall applications are in place. I also look after storage and back-up and recently undertook a review of the systems producing a report to the Head of IT on the benefits of moving to cloud computing. The review covered the expected cost savings, and the benefits with regard to storage and data backup. I have worked across many different IT vendor systems and applications including all the main brand names and am a proficient HTML programmer. I am now seeking a bigger role in a larger organisation and would very much like to be considered for this position. I am writing to apply for the above post of IT Administrator as I have over 10 years’ experience in this field and believe I have the skills and confident ability to be a valued member of your team. As you will see from my enclosed CV, I am presently employed as a (enter current position). My career to date has been focused on the provision of effective 1st and 2nd line IT support in demanding private and/or (change as appropriate) public sector environments. This valuable practical experience is underpinned by my professional qualifications gained in Computer Science (enter qualifications). Adept at analysing and documenting project scope and progress, I have proven my ability to oversee the delivery of a wide range of major projects. I have looked into your company and I can see that you have an impressive client base and I feel my background renders me an ideal candidate for this role. I would like to confirm that I am available for interview at any time and please do not hesitate to contact me if you wish to discuss my CV or application further. 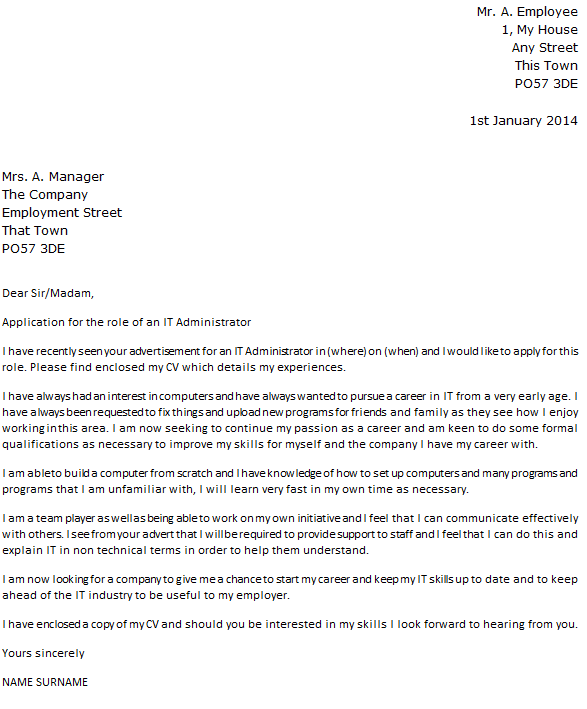 New IT Administrator cover letters has been added.